Every sneaker, accessory and piece of clothing. Following an early launch at HOODS Hong Kong and the Rae Sremmurd-centric lookbook, BAPE & NEIGHBORHOOD have finally allowed an official look at the duo’s full collaboration. Packed with co-branding and thematic prints, the items range from tweaked layering pieces to clever incense chambers¥. 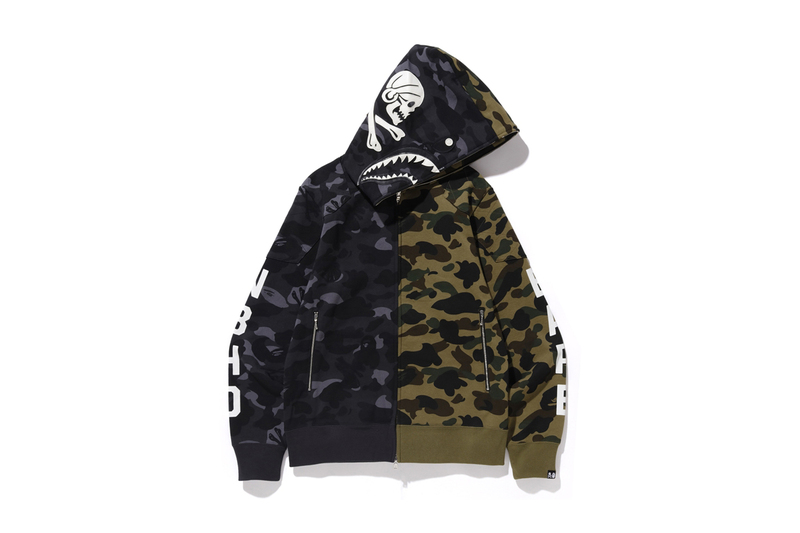 BAPE’s trademark Shark Mouth detailing is emblazoned across logo-heavy bi-color hoodies and bomber jackets, with both sweatpants and NBHD’s classic Savage Denim offering similar camouflage detailing, albeit in stencil form. “Bros. Hood” and mashed up Ape Head/Pirate logos appear on short- and long-sleeved T-shirts and caps alike, executed in monochrome shades. Joining the expansive clothing selection is the already-revealed POD S-3.1 “NHBAPE” and a revamped adidas NMD, dubbed the “NHBAPE NMD STLT,” each bearing stylized co-branding and camo accents. Completing the drop is a set of 100% and 400% BE@BRICK figures, each boasting half-and-half camo/solid tone detailing, complete with mashed-up logos. The collaborative clothing will hit the BAPE web store and both label’s physical outlets on January 2, while the BE@RBRICK figures will be in-store exclusives. Stay tuned for official release information for the duo of adidas sneakers, as each model will have a different release date and the same retail price: ¥26000 JPY, or approximately $230 USD. Most recently, we took a look at the lookbook for BAPE’s Spring/Summer 2019 collection. Along with the Nike Mars Yard Overshoe. Featuring Stüssy, Dover Street Market, Nike and Supreme. Honoring runners of the past. The single contains two different edits of the song.